Connexin-linked diseases are amongst the most common inherited diseases/syndromes worldwide estimated to affect over 2 million patients. Our laboratory is particularly interested in examining Cx26, Cx30 and Cx43 gene mutations that lead to hearing loss, various skin diseases and oculodentodigital dysplasia (ODDD). Interestingly, a number of loss- or gain-of-function mutations in Cx26 have been identified that result in only hearing loss while others exhibit trans-dominant effects on other connexins resulting in both hearing loss and various forms of human skin disease. In our laboratory, mutant connexins are expressed and characterized in a number of well understood cell lines as well as in tissue-relevant cells that are capable of undergoing differentiation. Genetically-modified mice that mimic human connexin-linked diseases are also routinely used. Our research program is particularly interested in determining the mechanisms underpinning ODDD. ODDD is primarily an autosomal-dominant human disorder where patients commonly display symptoms of congenital craniofacial deformities, ocular defects, enamel loss and fused digits. 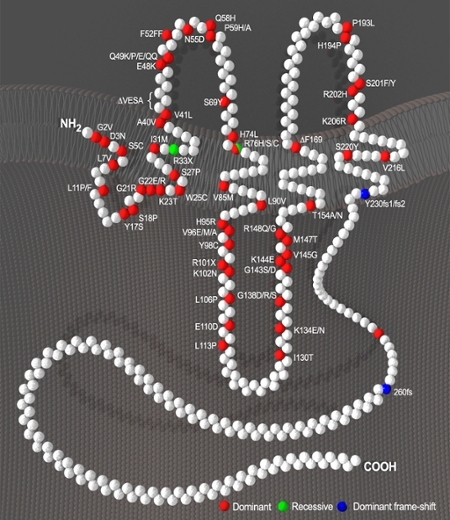 To date, there are over seventy-five known Cx43 gene mutations linked to ODDD, with the majority clustered in the N-terminal two-thirds of the Cx43 polypeptide sequence. The consequences of these mutations on Cx43 function are being investigated in reference cell systems and organotypic models such as the epidermis. These studies are being complemented with genetically-modified mouse models that harbor Cx43 mutants and mimic the human ODDD disease. In recent years we have also established several bench-to-bedside studies involving patient samples obtained from around the world. This approach has led to the establishment of a repository of ODDD patient samples and established cell lines that can be further used to explore the etiology of ODDD. Once mechanistic information is known as to how mutant connexins cause disease and developmental abnormalities, long-term goals include developing strategies to compensate for cellular defects caused by these mutants. D.W. Laird and P.D. Lampe (2018) "Therapeutic strategies targeting connexins" Nature Reviews Drug Discovery, doi:10.1038/nrd.2018.138 [Epub ahead of print]. (Highlighted by Schulich Media and in The Collaborator). D.W. Laird, C.C Naus and P.D. Lampe (2017) "Snapshot: Connexins and Disease" Cell 170: 1260-1260. E. Press, K.C. Alaga, K. Barr, Q. Shao, F. Bosen, K. Willecke and D.W. Laird (2017) "Disease-linked connexin26 S17F promotes volar skin abnormalities and mild wound healing defects in mice" Cell Death and Disease 8: e2845. E.R. Press, Q. Shao, J.J. Kelly, K. Chin, A. Alaga and D.W. Laird (2017) "Induction of cell death and gain-of-function properties of connexin26 mutants predicts severity of skin disorders and hearing loss" Journal of Biological Chemistry 292: 9721-9732. J.L. Esseltine, Q. Shao, C. Brooks, J. Sampson, D.H. Betts, C.A. Séguin and D.W. Laird (2017) "Connexin43 Mutant Patient-Derived Induced Pluripotent Stem Cells Exhibit Altered Differentiation Potential." Journal of Bone and Mineral Research 32: 1368-1385. M.K.G. Stewart, J. Simek and D.W. Laird (2015) “Insights into the role of connexins in mammary gland morphogenesis and function” Reproduction 149:R279-R290. 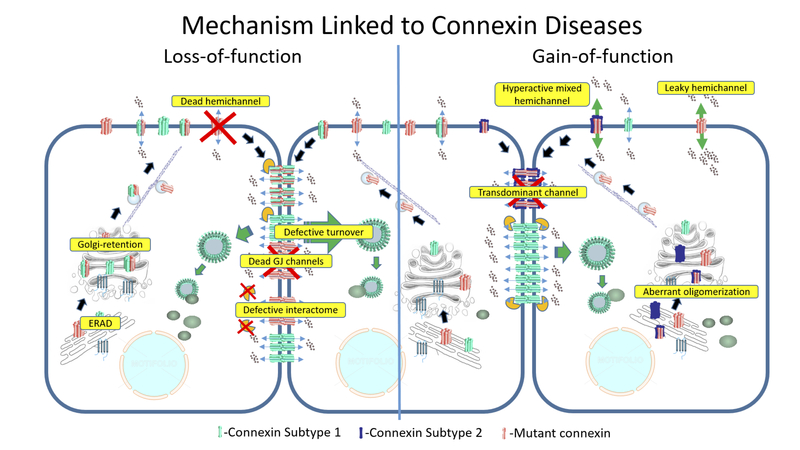 J.J. Kelly, J. Simek and D.W. Laird (2015) “Mechanisms linking connexin mutations to human diseases” Cell and Tissue Research 360: 701-721. D.W. Laird (2014) “Syndromic and non-syndromic disease-linked Cx43 mutations” FEBS Letters 588: 1339-1348. T. Huang, Q. Shao, K. Barr, G.I. Fishman and D.W. Laird (2014) “Myogenic bladder defects in mouse models of human oculodentodigital dysplasia” Biochemical Journal 457: 441-449. Y. Sun, X. Tong, H. Chen, T. Huang, Q. Shao, W. Huang, D.W. Laird and D. Bai (2014) “An endoplasmic reticulum-retained atrial fibrillation-linked connexin40 mutant impairs atrial gap junction channel function” Disease Models and Mechanisms 7:561-569. J.M. Churko and D.W. Laird (2013) “Gap junction remodeling in skin repair following wounding and disease” Physiology 28: 190-198. M.K.G. Stewart, X.-Q, Gong, K.J. Barr, D. Bai, G.I. Fishman and D.W. Laird (2013) “Mammary gland defects as revealed by genetically-modified mice harboring an oculodentodigital dysplasia-linked Cx43 mutant” Biochemical Journal 449: 401-213. J.M. Churko, J. Kelly, A. McDonald, J. Lee, J. Sampson, D. Bai, and D.W. Laird (2012) “Mutant Cx43 enhances keratinocyte proliferation without impacting keratinocyte migration” Experimental Dermatology 21: 612-618. *Image selected for the cover. J.M. Churko, Q. Shao, X-Q Gong, K. Swoboda, D. Bai, J. Sampson, D.W. Laird (2011) “Human dermal fibroblasts derived from oculodentodigital dysplasia patients suggest that patients have wound healing defects” Human Mutation 32: 456-466. J.M. Churko, J. Chan, Q. Shao and D.W. Laird (2011) “The G60S connexin43 mutant regulates hair growth and hair fiber morphology in a mouse model of human oculodentodigital dysplasia” Journal of Investigative Dermatology 131:2197-2204. J.M. Churko, S. Langlois, X. Pan, Q. Shao and D.W. Laird (2010) “The potency of the fs260 Cx43 mutant to impair keratinocyte differentiation is distinct from other disease-linked Cx43 mutants” Biochemical Journal 429: 473-483.